Sugar addiction, in my case, has manifested as cravings for sugary things, such as sweets, ice cream and chocolates, especially when I feel I need a pick-up and am feeling tired or unable to concentrate as well as I would like. But even more than sugar, I seem to crave pastries - croissants, Danish whirls, cheesy scones. And when hungry, the most satisfying meals seem to be potato meals, as well as pasta and rice dishes. I crave for all of these things and they all have to do with carbohydrates, which is sugar. And in the evenings, to give me energy, I crave alcohol, which again is a form of sugar and carbohydrate. Unfortunately the truth of this problem is slowly becoming clearer and clearer to me. Sugar addiction has often to do with candida overgrowth in the body, but even if candida is not involved, sugar addiction is a problem closely linked with bloated belly or belly fat, intestinal dysbiosis (lack of beneficial bacteria), adrenal fatigue, obesity, irritability, acid body pH and many other problems. And of course, the sugar cravings and carbohydrate cravings will get worse and worse as your body's endocrine glands and thus hormonal balance get compromised, candida and other opportunistic organisms take hold, and your system altogether becomes sluggish and toxic. So I have been diagnosed to be carbohydrate sensitive by my hair mineral analyst. By looking at the minerals that get deposited in the hair over three months, he is able to determine many things about my hormone balance, endocrine health and sugar metabolism. According to him, my low-protein, high-processed-carbohydrate vegetarian diet in the past, combined with stress, heavy metal toxicities and mineral deficiencies, has caused both my thyroid and adrenal glands to become sluggish. This, in turn, causes sugar addiction and an overall sensitivity to sugar, due to the impaired insulin metabolism and the fatigue associated with both the under-functioning of these glands and the blood sugar swings. The sugar that we crave provides a pick-up and whips the adrenals into action, similarly to caffeine... or prescription drugs and recreational drugs, such as cocaine. We are often intolerant to foods that we are addicted to. And so it turns out that sugar addiction is usually the same as carbohydrate intolerance. Sugar and carbohydrate are pretty much the same thing and although not all carbohydrates taste sweet, they all get converted to sugar in the body. So for ease of conversation, we'll just say that they are the same thing. Our blood sugar is low and we need quick energy from sugar. We feel tired and want sugar to wake us up. Candida or other anaerobic parasitic organisms in the body crave for sugar as food and 'tell' us to eat it. We haven't had enough healthy calories that day and need a quick calorie-rich fix to curb hunger. Something else to keep in mind is that it seems that it's possible to get low blood sugar problems without the low blood sugar showing as a reading on the blood glucose test meter. I have personally never had a low blood sugar reading, yet, am diagnosed as carbohydrate sensitive by a nutritionist and can feel many of the symptoms associated with low blood sugar, especially fatigue, carbohydrate cravings, and sometimes irritability as well. In addition, I have in the 6+ years started feeling very weak when I eat processed carbohydrates, sugary foods or bread and not enough fibre or protein to go with it. Although, of course, I did't know it was the processed carbohydrates, sugar and beer causing it. So at the bottom of the problem with sugar is usually the need for energy. And what causes the lack of energy is a key piece of the puzzle here in order to solve how to cure sugar addiction. If your low energy levels are caused by low blood sugar only, the cure is fairly straightforward: eat less processed carbs and sugar, and when you do, choose wholemeal (fibrous) carbohydrates and eat them with protein or fibre. Protein and fibre slow the release of sugar down and your body will be able to utilise it better, without blood sugar spikes. Less strain is put on the adrenal glands and the pancreas, as less hormones need to be produced to control the sugar in the blood. So, for example, have a slice of wholemeal bread with cheese (protein) and a few nuts on the side (protein). However, some, like me, may be more sensitive and not do well with bread at all. In this case bread and possibly all wheat and grains should be avoided. Generally white rice and pasta should also be avoided, as well as any refined sugars, because these are very quickly sugar-releasing foods and devoid of fibre, protein or minerals. Other high-carbohydrate foods, such as starchy potatoes, and sugary wholefoods, such as honey, should only be eaten in moderation and always with fibre or protein. Personally, I found the Dr. McCombs Diet a brilliant cure for sugar addiction, which is also an anti-candida diet. No sugar is allowed on the diet at all for the first 14 weeks and no grains or flour products for the first 10 weeks. I found out that the sugar cravings disappear within a couple of weeks. This would probably be the fastest way to cure the sugar addiction, although it does rely on supplements as well. Read Jeffrey McCombs' book: 'LifeForce' for more information. "When sugar enters the bloodstream, the pancreas secretes insulin which triggers cells to absorb the sugar. Many years of introducing quick bursts of sugar would eventually result in cells becoming resistant to insulin. This resistance would leave sugar in the bloodstream longer which would then cause the pancreas to release even more insulin. This excess insulin would eventually drive blood sugar below normal levels. [Dr. David] Jenkins (and others) discovered that, in addition to potentially causing diabetes, this effect would also produce cycles of hunger. Excess sugar consumption led to excess insulin which led to low blood sugar which led to hunger pangs which led to the consumption of more sugar." Dr. David Jenkins produced the glycemic index in the 1980s to help identify slower and faster releasing carbohydrate foods, the slower releasing being the healthier ones. The lower the foods glycemic index or glycemic load, the less it affects blood sugar and insulin levels - and the less symptoms of sugar addiction to follow some hours later and the next day. So high sugar diets stress the adrenal glands also, which produce cortisol, the stress hormone, in response to blood sugar spikes. This is explained in Marilyn Glenville's book: Fat in the Middle, which links excess cortisol production to abdominal fat. It is also explained in Dr. James L Wilson's book: Adrenal Fatigue: the 21st Century Stress Syndrome, which makes a point about reducing both sugar and caffeine consumption to heal from adrenal fatigue. When the adrenal glands and the pancreas get fatigued, they become less and less able to regulate the sugar levels and the blood sugar spikes get worse, in turn creating more fatigue and more need for sugar to pick you up. So if the problem in your case is not only low blood sugar levels, but a longer-term imbalance such as candida or adrenal fatigue, you will have to address those issues as well. I am currently on a supplement programme to strengthen my adrenal glands, as well as to deal with the carbohydrate sensitivity, slow metabolism and sluggish thyroid. All of these problems, however, my doctor was unable to diagnose, as he found nothing wrong with me. The nutritionist, however, found a familiar pattern of problems, with tiredness, difficult-to-control weight, and carbohydrate/ sugar addiction as symptoms. If you suspect you have candida or adrenal fatigue - and the odds are that you do since these are very common problems these days - please read the two books by Dr. McCombs and Dr. Wilson referenced above (book summaries to come). They are very enlightening. Just to reiterate: Keep in mind also that you can have these problems without the normal (allopathic) doctor being able to diagnose them - at least in my case the 'normal' doctor found nothing wrong with me and - indeed - as far as I know they don't have 'sugar addiction' listed as one of their treatable and recognisable conditions anyway. Good nutritionists, however, look for much higher standard of health and smaller variations in the test data. In my case the results of my hair mineral analysis have been a real eye-opener. If you can't afford to see a nutritionist, or buy supplements, I would suggest that you still have a good chance of being able to cure yourself of sugar addiction just by eliminating processed carbs and sugar from your diet. You can learn to make cheap probiotics at home, e.g. water kefir and fermented foods, and try to get many of the nutrients listed in the next chapter from wholefood sources, although of course in smaller quantities. The megavitamin doses detailed below are controversial at the moment anyway as to whether they bring the body out of balance. Wholefood sources are the safest way to supplement in my opinion, however, megavitamin therapy has been also shown to be very effective against many (more and less serious) conditions. There is a cheap multi-mineral supplement I have been taking, which is in liquid form, by Ambaya Gold: "Super-Conductive Ionic Minerals", that you may wish to consider, as well as the SCD Probiotics' ProBio Balance Original Mother Culture Concentrate, which is a cheap probiotic sold as plant food, but also an effective probiotic for humans, at least according to Ken Rohla, whose opinion I rate highly. So to heal sugar addiction on a budget, start with eliminating processed sugar and carbs, eat all your meals with protein and fibre, minimise alcohol and caffeine intake, include a form of meditation that relaxes you into your daily routine, and if you feel strong enough, exercise. Then see how it goes. If you struggle with candida and don't wish to purchase the whole McCombs Plan supplement package, I can give you some tips on how to do the plan cheaper, by combining home-made foods and probiotics with the plan. Dr. McCombs himself supported me via email through the whole McCombs Plan although I didn't spend a penny in his shop. At the very minimum you will need to buy the undecenoic acid which is a castor bean oil which kills candida. Below is my research for what nutrients to take to help overcome carbohydrate and sugar sensitivity and I suggest you see a nutritionist before using these supplements. The reason I suggest this is because it is better to devise your supplementation plan considering the whole body's health holistically. The dosages, also, are tailored to me and may not be suitable for you. Furthermore, keep in mind that taking one supplement will be unlikely to make much difference in how you feel, but combined dietary changes, stress reduction, and supplements to correct deficiencies and to support the glands (and eliminate candida if necessary) should have you on the way to recovery from sugar addiction and its associated weaknesses. I am currently taking vitamin B1 120mg per day (8000% of RDA), vitamin B2 24mg per day (1400% of RDA), vitamin B6 60mg per day (3000% of RDA), folic acid 400mcg per day (600% of RDA), vitamin B12 300mcg per day (5000% of RDA) and pantothenic acid 120mg (1200% of RDA), biotin (vitamin B7) 10mcg (18% of RDA), niacinamide (B3) 120mg (600%), pantothenic acid (vitamin B5) 300mg per day (3000% of RDA). B-vitamins are known as the 'stress vitamins' and they help to nourish and calm the adrenal function. Some of these also help the body to utilise carbohydrates and to balance blood sugar. I am taking 1200mcg (1000% of RDA). According to Marilyn Glenville's book: Fat in the Middle: Chromium is needed in the metabolism of sugar, helps to control cravings and reduces hunger. It also helps to break down fat and cholesterol in the blood. ProBio Balance by SCD Probiotics. I have 1 litre bottle and I take one or two capfuls every day. I may also start making water kefir again for an additional probiotic once I've moved flats. These help to balance the bacterial flora in the gut that would have been damaged by the use of refined carbohydrates. If you are deficient in zinc, insulin cannot do its job of controlling blood sugar properly. Zinc is clearly an important mineral to fight sugar addiction with, then, although a dietary change is more important. Vegetarians especially can be low in zinc, which is also needed for the production of hormones, for maintaining a healthy liver and for the immune system. I currently take 1/2 teasp per day as wholefood kelp powder. This is to support my thyroid gland as it is sluggish. Currently taking 400 IU per day (100% of RDA). However, 2000 IUs is recommended by Dr. Soram Khalsa, and I will purchase a stronger supplement once I have moved house, started my new job and as my financial situation improves. 450mg per day (114% of RDA). It calms the adrenal glands and helps to balance blood sugar. See also what I wrote about magnesium supplementation through the skin at 'How to Control Anger'. 300mg (500% of RDA) and some days an additional 2.3g (3880% of RDA). High doses of vitamin C are recommended in multivitamin therapy, whose proponents call for increasing the RDA recommendations. The book, Brain Allergies recommends high doses of vitamin C in treatment of some allergic reactions and mental illnesses. Dr. McCombs uses megadoses of vitamin C as part of his candida cure protocol. I take it to strengthen my immune system, to help with detoxifying, and to support my adrenal glands. Helps the liver to maintain a healthy blood sugar balance. 1.1g per day (108% of RDA). I am actually quite worried about taking the calcium supplement because of what David Wolfe has to say about calcium and calcification in the body, but since the hair mineral analyst assured me that the calcium in their supplements is bioavailable, and since they seem to think it is essential for me to supplement with this, I decided I would go with it for now. In addition, calcium is one of the alkaline minerals that get leached out of the body with an acidic diet, according to the books I've been reading on the topic recently. And since my diet has in the past been acidic for long stretches of time, it may well be that I require supplementation. I will take it for now and see what my next mineral test looks like. 150mg per day. It is an amino acid and according to Theodore Baroody in 'Alkalize or Die' it helps to reduce stress and cravings for alcohol. L-cysteine acts as a catalyst for glutathione production and thus increases glutathione in the body, which is an antioxidant. Has been reported to help strengthen the liver. Nourishing for the adrenal glands. In addition, I am taking some other supplements recommended by the hair mineral analyst, e.g. enzymes, fish oil for Omega 3s (helps with correct functioning of insulin), trimethylglycine, boron, ox bile, pancreatin, black radish, liver glandular, betaine hydrochloride (HCL, i.e. stomach acid - 75mg per day). The HCL is meant to help with better digestion and absorption of nutrients but it is controversial, as the body may compensate by producing less HCL and thus it goes out of balance. Alpha brainwaves are shown to reduce cortisol, the stress hormone. So I try to do some relaxation, guided meditation, or Holosync meditation everyday. Helps to balance hormones and reduce stress and cortisol. I run for 20 minutes around the park most days. A healthy alkaline diet will help to keep your energy levels up and will also help to strenghten inner organs. Start by adding a half a lemon squeezed into a glass of water twice every day. But for better results, study the alkaline diet and measure your pH levels every day to ensure you stay at the optimal pH. In conclusion, I can say that purely by staying completely away from sugar, all processed carbs and alcohol for some weeks or months, and eating healthy alkaline foods, one can eliminate most of the sugar cravings. You may be surprised how quickly your taste buds and body adjust. 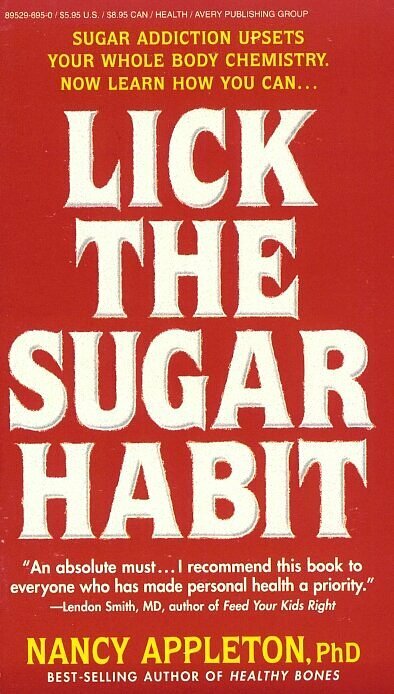 Sometimes, however, it may be easier to quit sugar with the help of supplementation. If you find it too hard to do you can suspect bigger imbalances underlying and should look to curing candida and adrenal fatigue first on your way to healing sugar addiction. How does it feel to be a sugar addict? Withdrawing from sugar I experienced headaches, low moods, flu-like symptoms, fatigue, and cravings for sugar, carbohydrates and alcohol. Through research I came to understand the bigger picture of sugar addiction, linked to brain chemicals, emotions, hypoglycaemia, underlying stressors and traumas, nutritional deficiencies and not enjoying ones life enough.